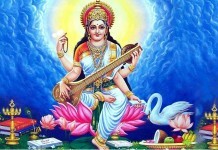 Saraswati, the goddess of knowledge and arts, represents the free flow of wisdom and consciousness. 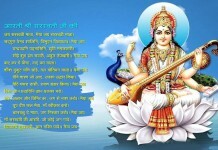 She is the mother of the Vedas, and chants to her, called the ‘Saraswati Vandana’ often begin and end Vedic lessons. 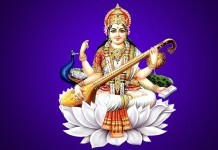 Meaning – Salutations to Devi Saraswati, Who is pure white like Jasmine, with the coolness of Moon, brightness of Snow and shine like the garland of Pearls; and Who is covered with pure white garments, Whose hands are adorned with Veena (a stringed musical instrument) and the boon-giving staff; and Who is seated on pure white Lotus, Who is always adored by Lord Brahma, Lord Acyuta (Lord Vishnu), Lord Shankara and other Devas, O Goddess Saraswati, please protect me and remove my ignorance completely. 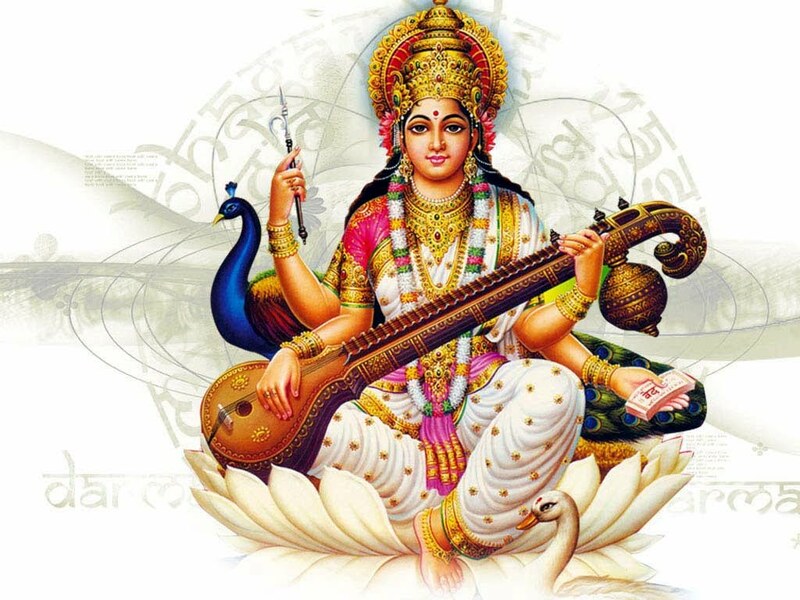 Saraswati is the Goddess of Knowledge, arts, of beauty, music and truth symbolized by a beautiful woman with four hands, riding on a white swan among water lilies to tell humanity that science is like a beautiful woman. Her hands hold a palm leaf; a lontar, (a Balinese traditional book which is the source of science or knowledge); a chain (genitri with 108 pieces) symbolising that knowledge is never ending and has an everlasting life cycle; and a musical instrument (guitar or wina) symbolising that science develops through the growth of culture. The swans symbolise prudence, so that one’s knowledge may distinguish between good and evil and the water lilies (Lotus) are symbols of holiness. The Lotus flower is the holiest for Balinese. 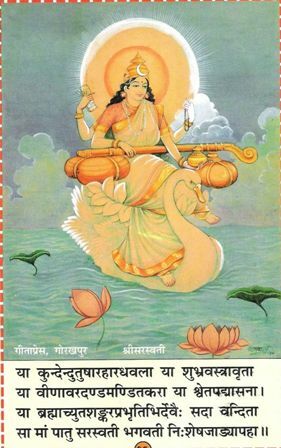 The Sanskrit word sara means “essence” and swa means “self.” Thus Saraswati means “the essence of the self.” Saraswati is represented in Hindu mythology as the divine consort of Lord Brahma, the Creator of the universe. 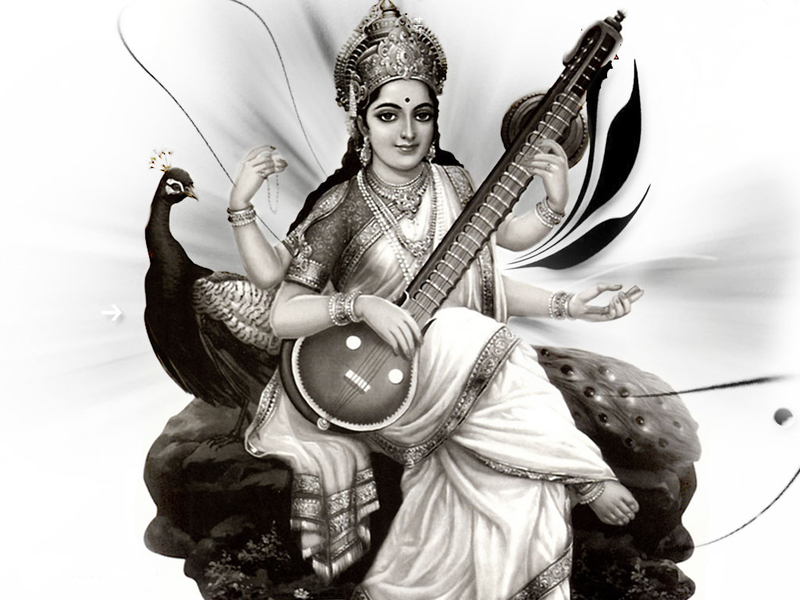 Since knowledge is necessary for creation, Saraswati symbolizes the creative power of Brahma. 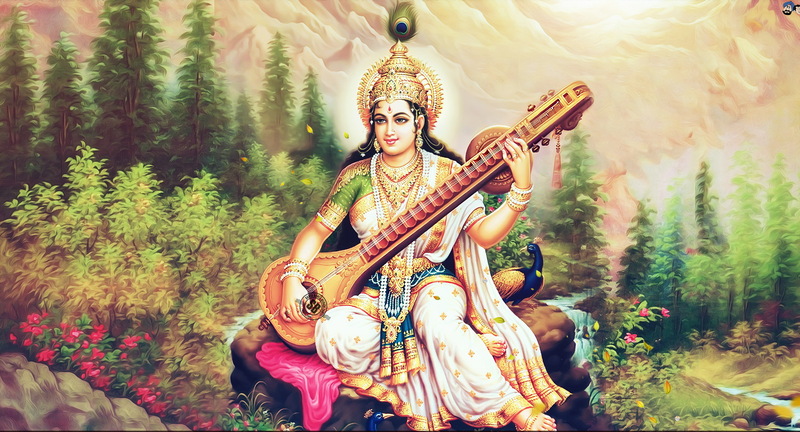 Goddess Saraswati is worshiped by all persons interested in knowledge, especially students, teachers, scholars, and scientists.